Don't believe Soft Robots could be dangerous? Elon Musk says Artificial Intelligence could be more dangerous than Nukes. 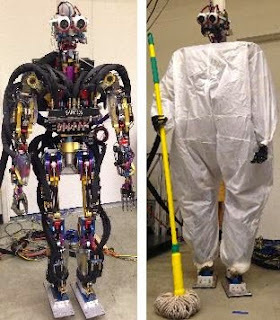 How would we know to fear robots if the next terminator model actually looked like a giant balloon poodle? I know, concerning right? 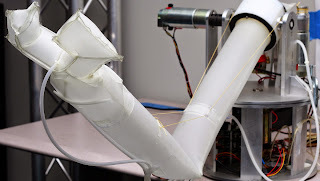 Turns out, when the BH6 filmmakers were scouting for ideas, they came across an inflatable robot arm project in 2011 being created at Carnegie Mellon University by scientist Siddharth Sanan, working with Mike Ornstein and Justin B. Moidel, under the guidance of Professor Christopher Atkeson. 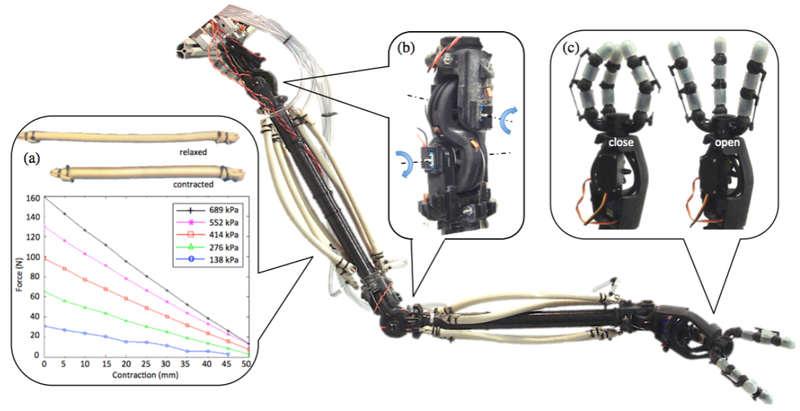 At the time it was a breakthrough in soft robotics. The arm could turn, bend at the elbow and even pick up light objects. Flash forward to 2015 and CMU's Professor Christopher Atkeson is now heading up a project to create an actual Baymax (or Baymax like) robot. Their biggest problems seems to be that Baymax's internal workings appear to work by 'movie magic', a resource that's going to earn someone millions if they ever work out how to sell it in bottles alongside fairy dust and miracles. CMU's Sarcos humanoid robot as a skeleton (left). Right, added lightweight inflatable suit. So far real world examples look a bit like a T-700 Terminator exoskeleton wearing white overalls - which doesn't fair well for giving them a friendly bedside manner. That said, Baymax does have a light weight internal skeleton, which you get brief glimpses of in the movie. With my passing interest in actually building robots I would have thought pneumatics, rather than gear wheels would be the way to go for soft robots. Turns out someone over at CMU is already exploring that idea with this design of a functioning pneumatic arm (see image below). pneumatic muscles to control the various limbs. It seems simple enough just looking at an arm but you've still got to find somewhere to put all the batteries and other circuits needed to control everything and keep the robot stable so when you hit the 'on' switch it doesn't just go 'Errp!' and fall over. Looking at Disney's internal designs for Baymax (below) I'd consider putting the battery packs in the feet for better stability. It could be like one of those inflatable punching bags - knock it over and it bounces right up again. 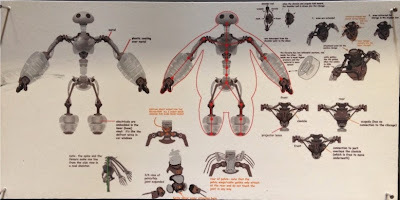 Disney Internal Skeleton concept sketch for Baymax. If soft robotics really took off with a completely autonomous humanoid design I could see the next step being all those people employed as cuddly team mascots and hugable theme park characters losing their jobs. The ultimate kick in the nuts - you know what I'm sayin'? Why not? 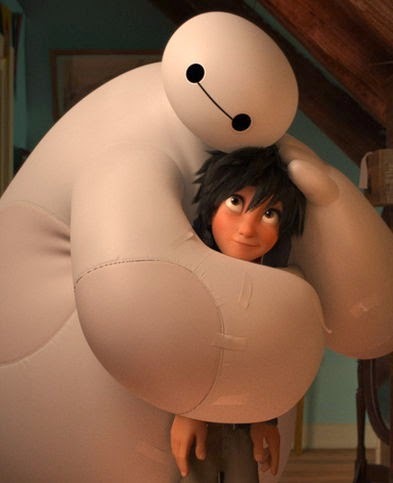 If Baymax can have an armored suit built for him then why not put him inside a cuddly theme park character suit too? Holy crap! Imagine if the robot uprising began with an uprising of Disney themepark characters... we'd never see that coming... good thing I bought Soft Robotics to your attention!